Time, consideration, and diligence are essential in achieving a flawless, graceful appearance. We, at Premier Wigs, know the tedious measures that must be taken to ensure that your hair is carefully crafted to accentuate your features. Tony Zhang, the CEO of Premier Wigs, attended an evening gala which concluded an international business development conference. Men and women from all corners of the world came together to celebrate the ideas and newly-formed coalitions that would contribute to China’s economic prosperity and opening to the global community. In the midst of information being exchanged, Tony could not help but be impressed by the fashion sense that pervaded the atmosphere. The intricate knot of a tie. The chip-less polish coated over a square tipped fingernail. Summer’s perfume in the cold of Qingdao. Of all of the distinguishing characteristics, it was hair that seized Tony’s attention. “The women wore their hair like crowns, such precious jewels”, he recalled. A lively discussion among a group of women sparked Tony’s interest in the hair business. After some maintenance and styling tips were shared, the topic shifted to the frustrating common issues the women faced when shopping for reliable hair suppliers—brittle virgin hair, tangled remy cuticles, free-fall shedding, and uncooperative customer service agents. Integrity was missing from companies and, in turn, was threatening to compromise the reputation of those women who understood the link between appearances and affability. Tony saw an opportunity to supply those dignified women with the quality of hair products that they deserved, and to restore the trust lost in major hair manufacturers. Our company started as a response to a faulty relationship between hair admirers and the suppliers. 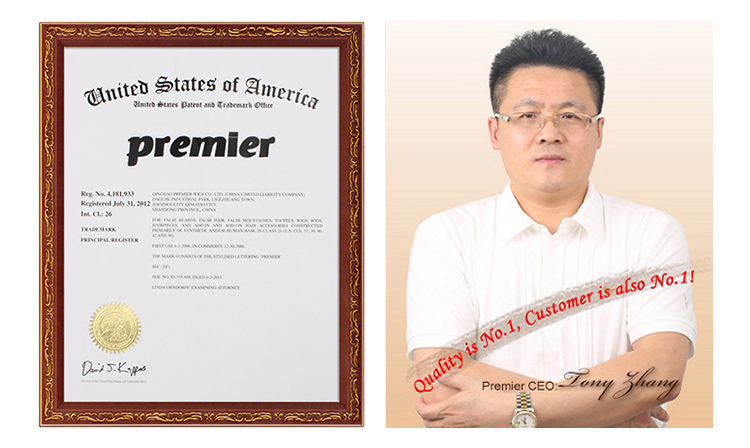 Since then, Premier Wigs has grown into one of China’s top hair manufacturers for the international community. As a proactive seeker of improved methods and materials, we have remained committed to the idea that quality should never be compromised. Premier Wigs provides the largest variety of hair extension products. Global and localized trends creates a lot of room for varied and flexible options to customize each order to your needs and desires. We’ve catered to wholesalers in the United States, Japan, Nigeria, Germany, Canada, the United Kingdom, as well as other countries. Your hair is your crown, and for 20 years, Premier Wigs has been the prime destination for such a jewel. We welcome you to try one of our products and experience it for yourself.